This section is from the book "British Wild Flowers - In Their Natural Haunts Vol2-4", by A. R. Horwood. Also available from Amazon: A British Wild Flowers In Their Natural Haunts. Cardigan, Denbigh, Flint, S. Lanes, S.E. Yorks, Northumberland, but is ubiquitous elsewhere. In Scotland it is found on the coasts of Dumfries, Kirkcudbright, Wigtown, Fife. It is thus general from Fife to Kent and Devon. It is native in Ireland and the Channel Islands. Sea Lavender is found on muddy shores, flat coasts, and estuaries, especially on the east coast as well as on the west, where the rocky foreshore is flanked by stretches of mud or sand. It is found where Thrift, Sea Purslane, Sea Milkwort, Seaside Bindweed, and Sea Plantain grow. The aerial flowering stem is really a scape, and all the leaves are radical, having a wavy margin, with long leaf-stalks, and pinnately-arranged veins. The leaves are oblong, smooth, blunt, and mucronate, or bluntly terminated with a sharp point. The flowers are small but conspicuous, blue, and borne on leafless scapes or flowering stems, which are numerous, angular, and bear terminal flowers in a much-branched corymb or panicle, each spikelet bearing two or three flowers, and the spikes are spreading and even curved backwards. The outer bracts or leaflike organs of the calyx are rounded on the back, the calyx lobes having intermediate teeth. The calyx and corolla each form a tube. There is honey at the base of the latter. The plant is about 1 ft. high. It flowers between May and August. It is perennial, and propagated by division, and worthy of cultivation. The flowers are dimorphic, of two types. Being a maritime plant the flower is not visited by insects like an inland species. The petals have long claws or stalks, the stamens are opposite the corolla lobes, and the anther-stalks are threadlike; the anthers open inwards, and the styles are free, their stigmas being hairlike or linear, and the flower is thus adapted to self-pollination. The anthers are ripe before the stigma. The calyx is coloured. The calyx does not fall, and some flowers have undeveloped anthers; being membranous above, the capsule is dispersed by the wind. Sea Lavender is a salt-lover and requires a saline soil, being also a sand-loving plant and growing on a sand soil. A micro-fungus, Uromyces limonii attacks it. A beetle, Apion limonii, and a moth, Adactyla bennetii, are to be found upon it. Limonium, Dioscorides, is from the Greek leimonios, belonging to a moist place or meadow, and the second Latin name refers to its common occurrence. The plant is known as Sea Lavender, Lavender Thrift. A former name, Statice (now applied to Thrift), was given to Sea Lavender for the supposed property it possessed of stopping diarrhoea. Essential Specific Characters: 196. 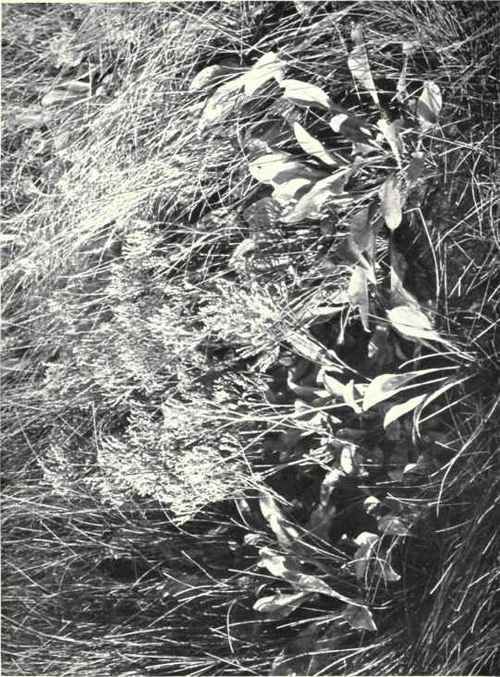 Limonium vulgare, Mill. - Flowering stem a scape, leaves radical, oblong, petiolate, mucronate, 1-ribbed, flowers purple, in a secund panicle in dense patent spikes, with outer bract rounded on back, scentless, flower-stalk angular, leafless, branched.